They sit hunched over, looking like a coven of witches in bedraggled coats of black feathers. The three weird sisters in Macbeth, maybe, stirring a cauldron of trouble. Long wrinkled necks and bald heads are bent over the sad pile of roadkill at the edge of the highway. They study it, solemnly conferring with each other. More like funeral directors than witches, perhaps–a group of shabby undertakers. No wonder a group of these odd birds is called a wake of vultures. My approaching car makes the birds sit up straighter. They give me a suspicious glare from beady eyes. Then they take wing. A sudden, strong jump into the air, and the vulture’s wingtips reach out like widespread fingers. Higher and higher they lift on the air, soaring on thermal air currents with the majesty of eagles. Long black wings set in a shallow “V” shape, vultures sail for hours with nary a flap. They glide and soar and weave complicated patterns around each other. The three birds, so shabby and scraggly on the ground, dance in the air like ballerinas. Vultures fly high over our heads, but they’re always scanning the world. They look down on us, see our bald spots, our backyards, our secrets. They see us. And they smell us. Unlike most birds, vultures have a keen sense of smell. The delicious odor of rotting flesh, wafting high in the air, is like ringing the dinner bell. Down they drop, one by one, to feast on that which most of us don’t want to look at—the deer corpse flung to the side of the highway, the mashed rabbit, the squished squirrel. Like undertakers, theirs is a sad but necessary task—cleaning up the world’s messes and tragedies. Like undertakers, they get a good deal out of it—an easy meal, no need for all that bothersome hunting and stalking and tracking of elusive prey species. Let someone else do the dirty work is their motto—we’ll eat the leftovers! Also like undertakers, they have a job no one else wants. Most animals, humans included, are repelled by that which attracts a vulture. We’re warned away from possible stomachache by the slightest odor of rottenness. But vultures can happily digest meals that would kill other creatures. Carrion with a side-order of bacteria. Cholera, anthrax, botulism—no big deal to a vulture. Powerful acids in the birds’ stomach murder the deadly bacteria. Lethal pathogens are destroyed, courtesy of the helpful vultures. Witches, ballerinas, or undertakers? Disgusting freeloaders, or sanitation engineers? 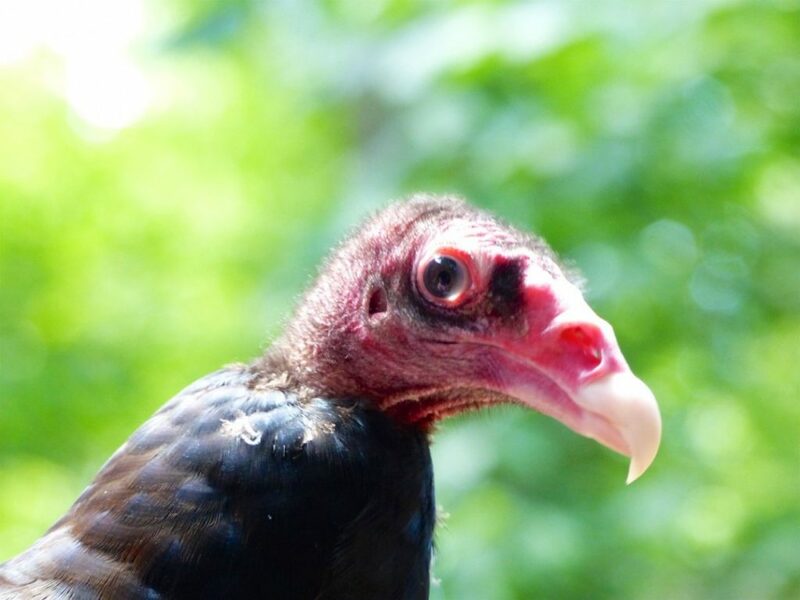 Thanks to Nancy Castaldo for the vulture portrait!